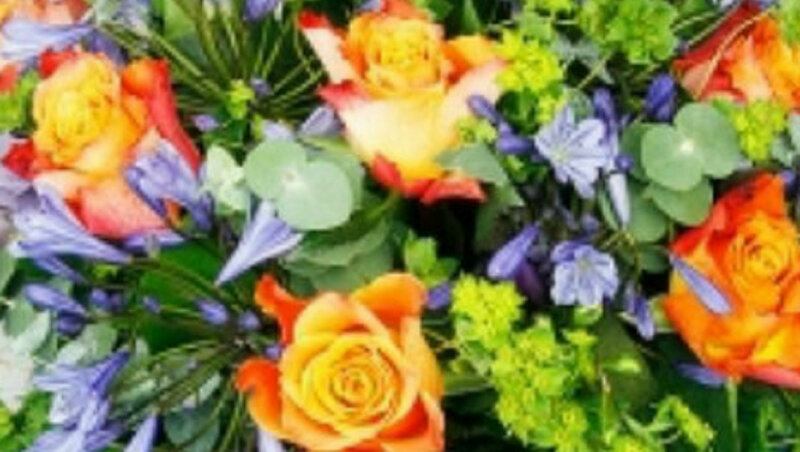 A sublime mix of cherry brandy roses, ocean blue agapanthus and bupleurum flower foliage. It is guaranteed to satisfy just about any lucky recipient. The flowers were very nice. I guess that they could've been delivered earlier on in the day, but delivery was free, only drawback with the free delivery option is that it doesn't seem to ever come in the morning, this is the third order I have made with the company. So, if you need a delivery in the morning, you better request it as it will not arrive then otherwise. My order arrived on the day i wanted,in perfect condition and the over all price was more than reasonable,do not hesitate to use Flower Station, i'm confident enough to say 'they will not disappoint you'. The bouquet wasn't looking so colorful as in the picture. The selection resulted in a quite darker bouquet. But the service have been great and the online support was great as well, as I needed to change the text on the message and they did it quickly; just with an email exchange. Didnt arrive on right day and wrong flowers delivered! The flowers didn't arrive on the day they were supposed to (1 day late) and the flowers ordered were not delivered. They had replaced the flowers with a completely different bouquet (the original ones were chosen for a particular, personal reason). This was ok in the end, and the flowers were beautiful but an email saying the flowers were going to be delayed and replacement flowers were to be given, would have been nice.